Fortieth birthday gag gifts are especially appropriate because 40 is the perfect age for fun. Celebrants aren't yet considered old, but then they're not considered young either. It's an age where looking back is still fun, and looking ahead can be a little frightening. Does this person have a good sense of humor? If not, then a more straight-forward gift might be more appropriate. 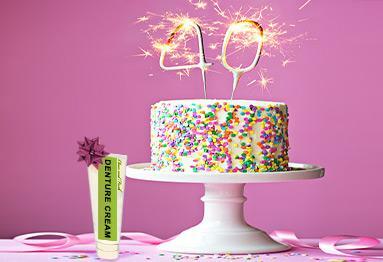 Is the recipient horrified by aging, or upset about turning 40? Reminders of his or her age may not make the humorous impression you're hoping for. Would a gag gift be appropriate for the event and the location of the party? If you're attending a fancy party or other formal gathering, the gag gift may be better given privately at a later time. Once you've decided to go ahead with a gag gift, it's time to aim for maximum humor! Here are some ideas that you can use and add to. You can also round out the gift by gathering "helpful" brochures and information, such as hand-outs from senior's homes, health insurance applications for the elderly, and other literature from service providers. If you want this to be a very big gift basket, ask other friends and relatives to pitch in and add more items, giving the gag gift as a group at the birthday party. I'm not 40. I'm 39 and holding. 40 is the new 18. I'm not 40. I'm 20. Twice. It took me 40 years to look this good. A vial full of dirt, with a tag attached that reads, "Something older than (person's name)"
The main thing to consider is to keep the gag gifts light-hearted and fun. Funny gag gifts are great for a 40th birthday, but make sure you don't go overboard with them and spoil the fun.